I didn’t sleep well, I think it was trepidation and nerves at starting walking again. The sky looked pretty dark but it wasn’t raining when I walked along the front at 8.30am. As soon as I rounded the castle I was nearly blown off my feet by the wind. Fortunately it died down a bit during the day but I was walking into a noticeable headwind and did wonder if it would have been easier to walk clockwise? Coming out of Aberystwyth I crossed the Afon Ystwyth that flows out into the harbour and climbed a (almost vertical) grassy cliff. 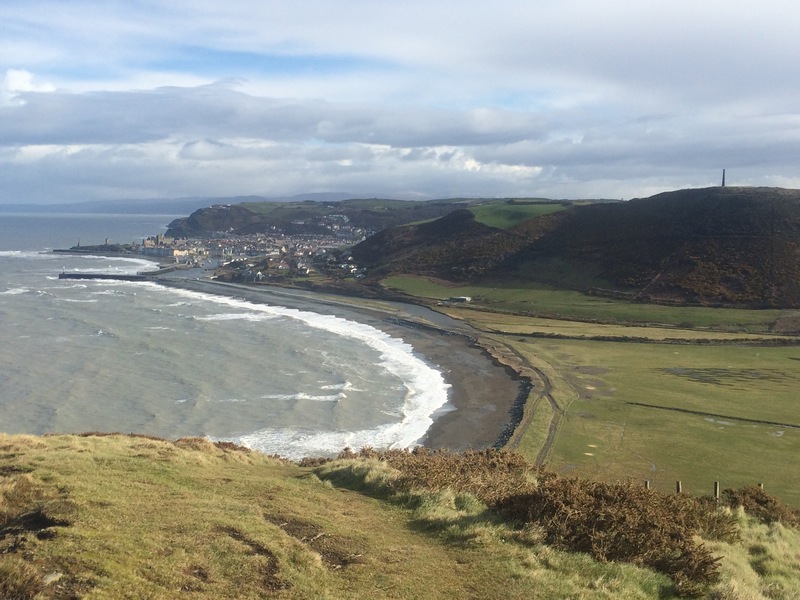 I got a great view of Pendinas hill, with its fort and monument, and Constitution Hill, with its cliff railway and camera obscura; Aberystwyth town was snuggled in between. The weather was very changeable, lots of heavy showers, but I was lucky that the sun came out so I could admire the view back to Aberystwyth. I could even make out the Lleyn Peninsula in the distance. I spent a lot of time walking along cliffs today. There were lots of gulls about, and some fulmars, enjoying the wind, but the brown sea looked cold and empty. I was reminded of home by the number of red kites that I saw swooping about over the land and the sea. 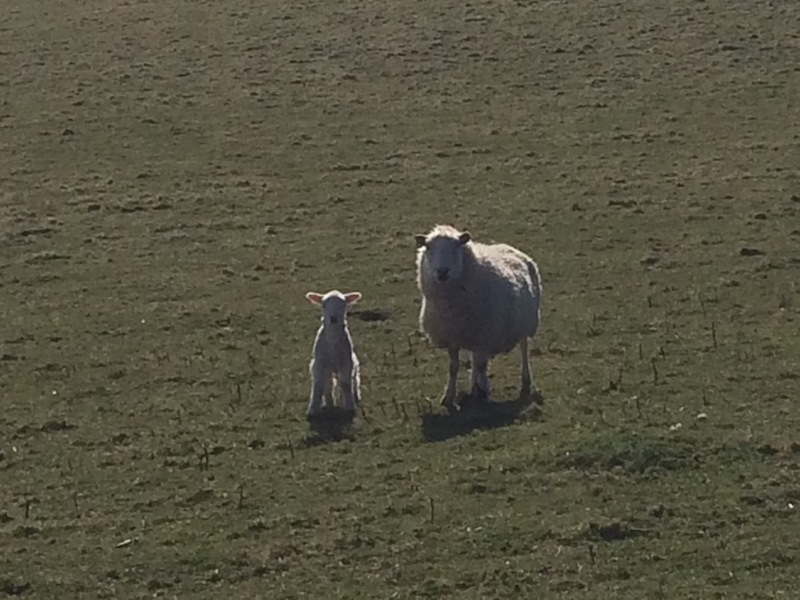 Spring has definitely sprung as there are plenty of lambs about. 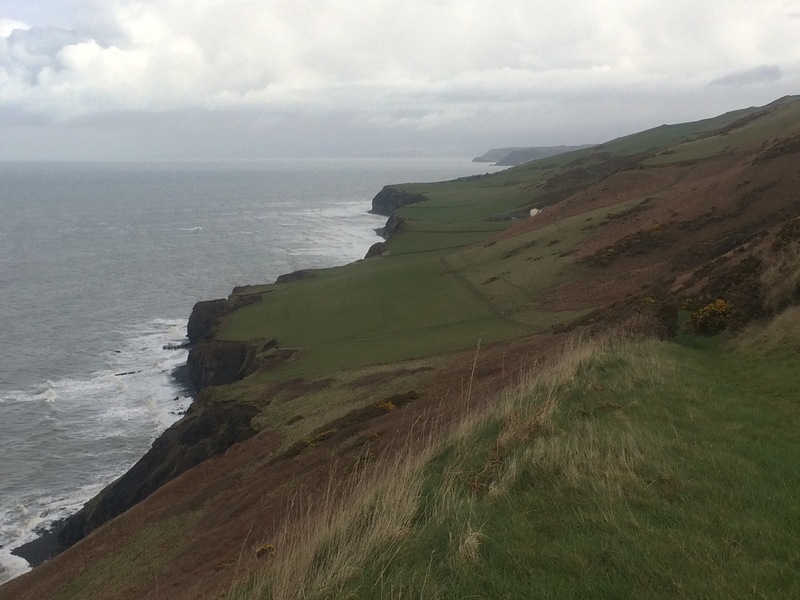 I walked 10 miles over the cliffs in solitude, passing only one caravan park, to the next settlement of Llanrhystud. Between rain showers I managed to stop for a quick picnic of homemade scones – the last of the food from home. 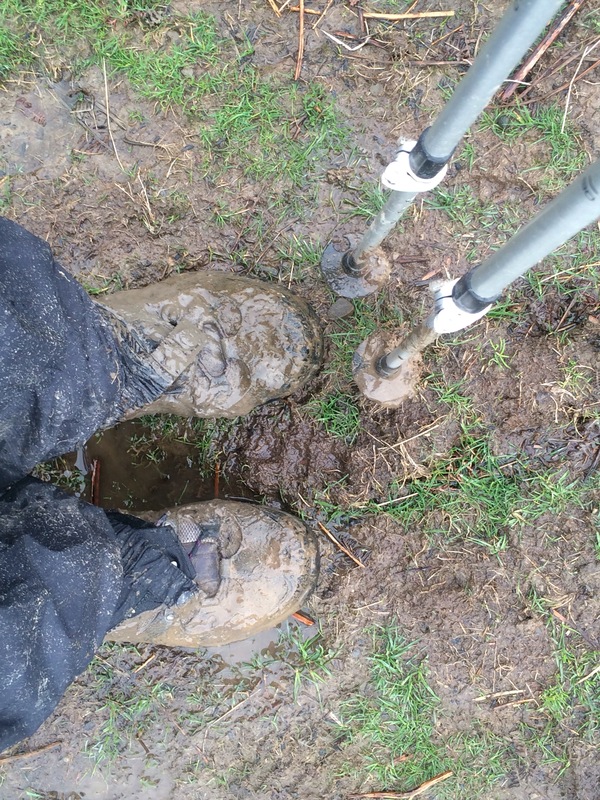 The going was muddy and slippy in places but thankfully I had poles to keep me upright. definitely a poles and boots day! 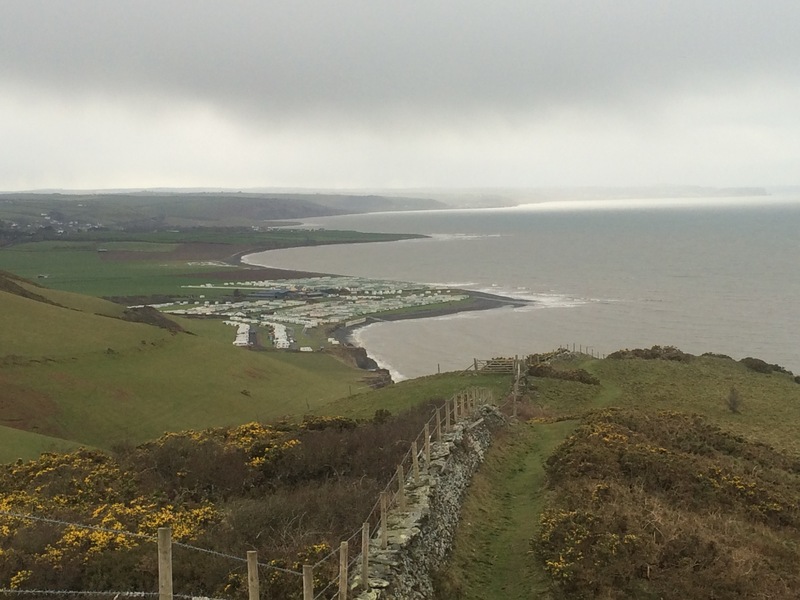 Llanon to Aberaeron was across fields next to the stony beach, and in some places the path had eroded to the extent that the path had disappeared and I was forced into the stones. I survived an hour long heavy rain burst that included a rather painful hailstorm. 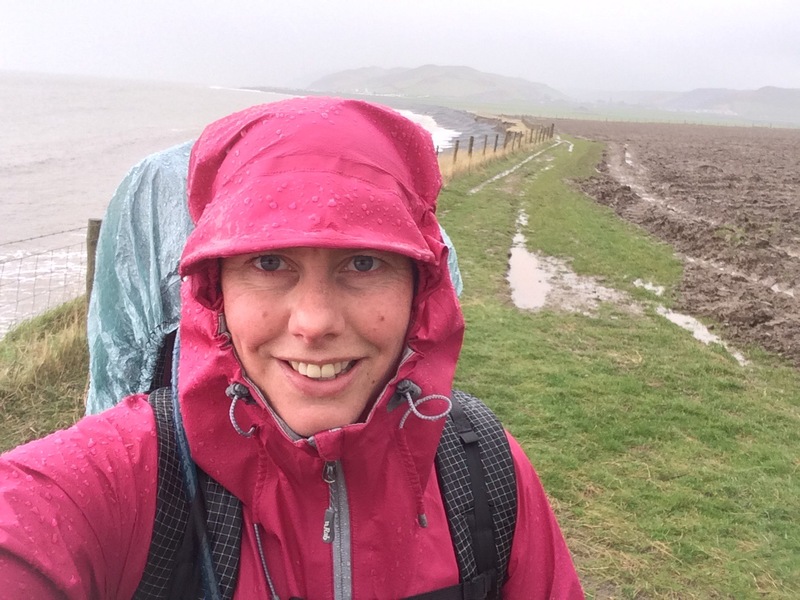 raining again – smiling before the hailstorm hit! 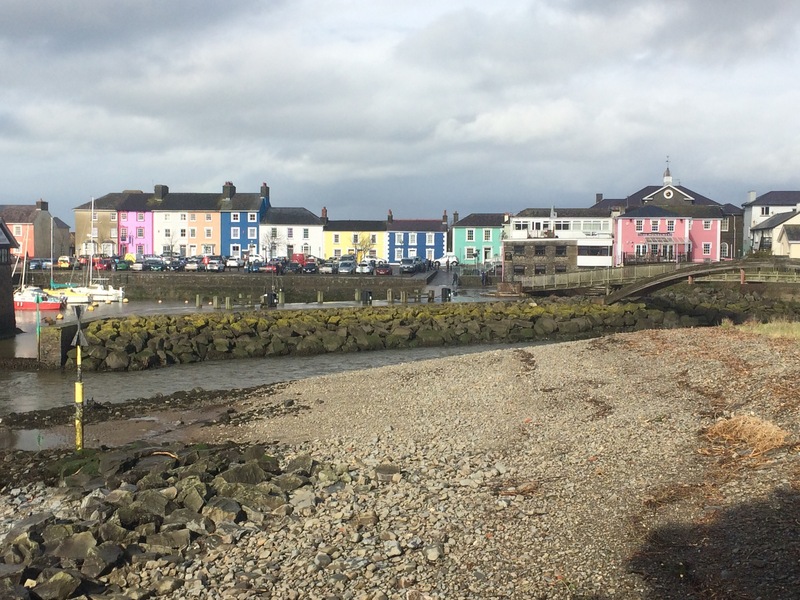 I made it to Aberaeron late afternoon, just as the sun came out again. Such a pretty town with its painted houses set out around the harbour. A quick stop at the shop for a bottle of wine and then I was treated to a lovely evening in the company of Friz and Deb, in their beautiful house overlooking the harbour. 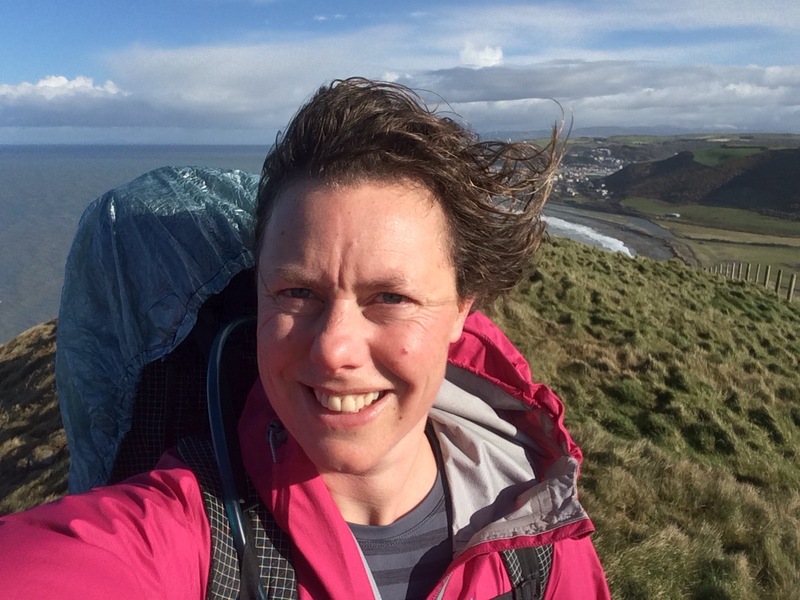 I did wonder if it wise to have covered 18 miles on my first day back – a few aches and pains! Yesssssssssssssssssssss! Day One done……tick VG! Well Done Juice…….enjoy the views and be safe. Best F&C in Wales in that lovely town of Abereron…….many Sundays spent fishing for crab on the pier outside the Blue Anchor……..on on.